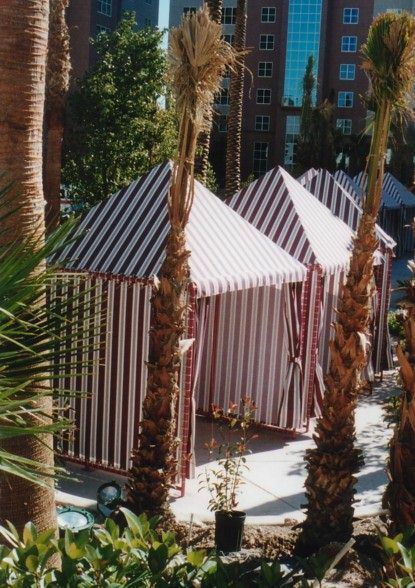 Pool Cabanas and Spa Cabanas are popular resort rentals and offer great privacy in public areas. 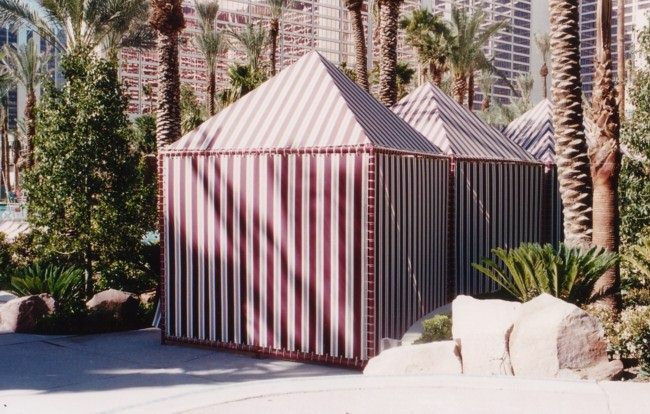 Each Pool Cabana measures consist of polyester powder coat painted steel frames with Sunbrella® brand 5-year warranty fabrics. 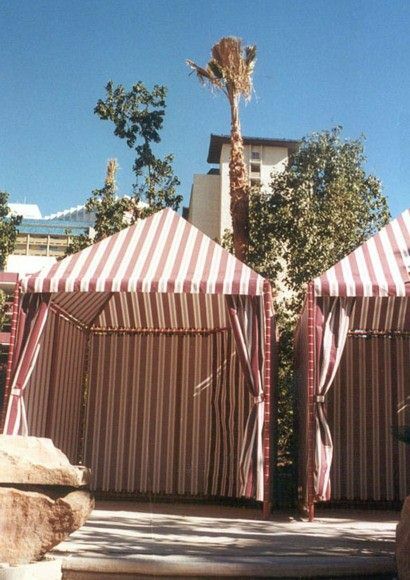 These portable pool cabana canopies were fabricated and installed on the premises of this classic Las Vegas Hotel. The 10' x 10' portable canopies were manufactured of painted steel frames and Mainstreet brand exterior grade fabric covers. Each cabana design included a small dressing room, a television, furniture and lights. FRAME: 1-5/8" diameter 17ga galvanized steel tubing. TOP COVER: Sunbrella brand stripes and sold patterns. (awning grade), laces to frame, hanging valance front only. Cover attaches to frame with buckle and strap mechanism. SIDE CURTAINS: Sunbrella, 3 sides lace to frame, front curtain traversing on stainless steel cable system. WOVEN: Calliope*, Dickson®, Mainstreet*, Sunbrella®, Sunbrella® Firesist* and much more. VINYL: Cool-Glo*, Clear Vinyl*, Ferrari*, Patio 500*, Weblon* and more. MESH: Soltis*, Textilene* and more. Polyester Powder Coat Paint - Custom Colors: Royal Blue, Red, Forest Green, Off-White and more.